A Road Less Traveled: Hike the Y! I can’t tell you how grateful I am that our boys don’t play football! I am a sports nut. In particular I am a college football nut. We love to watch our BYU cougars (don’t mention last weekend!) each Saturday through the fall. We follow the Tennessee Volunteers, the MTSU Blue Raiders, Oregon, Oregon State, Boise State and Utah (in hopes that the Utes lose!) on a weekly basis. Taylor, Parker and I can turn on a game and instantly become rabid fans of the underdog, pinning our happiness over the next 3 hours to the fortunes of some college kids we’ve never met. Indeed, we LOVE college football around here. As I mentioned above, we are big BYU fans. As some of you may know, BYU is nestled in beautiful Utah Valley in Provo, UT. 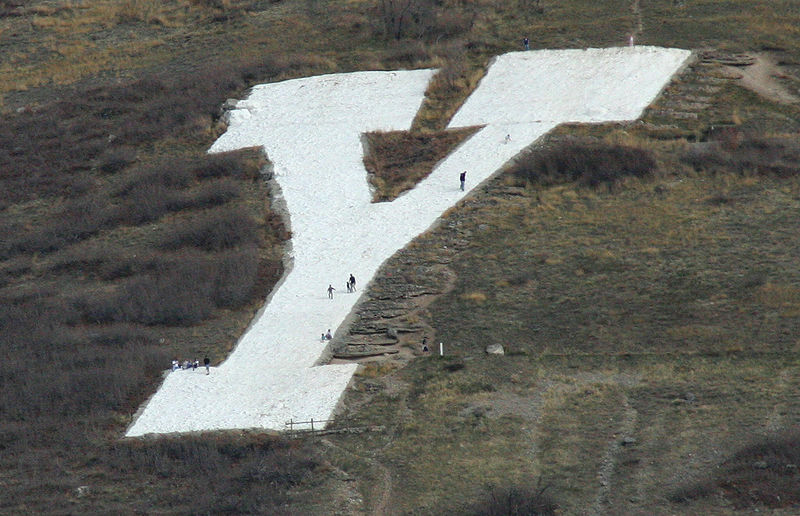 It sits at the base of Y mountain, which has a huge, white block “Y” half way to the summit. This Y is visible for miles around. (In fact, you can see it from Herriman, where we live, about 40 miles away.) It is 380 feet high and 130 feet wide. It is the biggest college symbol in the US and is bigger than the letters in the Hollywood sign in California. You can get a feel for the size of the Y from this picture. You can see several people hiking on it. At the base of Y mountain is a trailhead which leads to the Y. It is a steep 1.25 mile hike up. I’ve been wanting to take the boys to the Y for quite some time. In fact, I’d eventually like to hike with them to the top of the mountain. But since I already do a couple of big camping activities each year with just Taylor and Parker, I thought this could be a family activity. Elli obviously couldn’t go, but I thought the other kids could at least give it a shot. Christi was originally going to come, but didn’t feel up to it that day, so she stayed with Elli. Taylor, Parker, Jesi, Graci, Xander and I attacked the mountain on August 28th. Here’s a picture of the kids before setting off. If you look carefully, you can see the Y on the mountainside way above them. It is just a flat white spot close to the base of the rock outcroppings towards the top of the mountain and is centered in the picture. It helps to double click the picture to enlarge it. The trail has about 11 switchbacks. 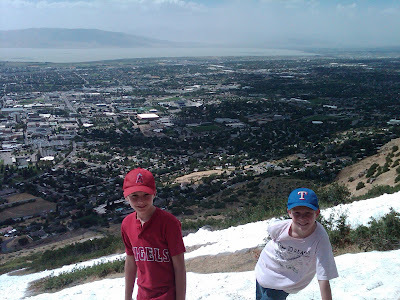 Each switchback has a place to rest and look out over Utah Valley and Utah lake below. 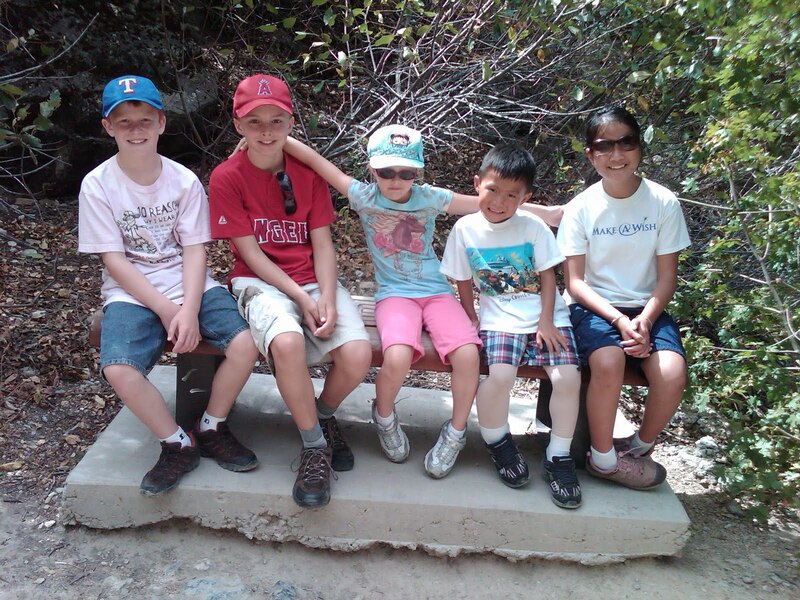 The kids loved stopping at the resting points and taking pictures. They also loved taking turns being the leader on each switchback. Everyone else had to stay behind the leader, who would announce as soon as they saw the sign indicating the end of the switchback we were on and the beginning of the next one. It was really cute. On the second to last switchback, we had a great view of the Y from below. As I mentioned before, this is a really steep hike that never really lets up. It’s not very long, but there are virtually no flat areas, so you’re climbing the entire time. I was really impressed with all of the kids, but especially with Graci. She paced herself and was able to hike almost the entire way. I piggy-backed her for a short spell, but other than that, she made the entire climb herself. (This hike did convince her that she did not, in fact, want to accompany us on our annual Lone Peak hike the next weekend☺.) Jesi also did very well, although I must say I don’t think she would have made it if Taylor hadn’t carried her for about ¼ of a mile. Go Taylor!!! Parker was a complete wimp and was actually in tears at one point, saying he couldn’t go on. OK, I just made that up about Parker because I know it will mortify him when he reads it tomorrow. Love you, Park☺. As you can see above, Parker actually carried Xander part of the way up! It was a great family experience. I feel so blessed to have kids who love each other so much. Taylor carried both Xander and Jesi at different times on the way up. Parker carried Xander. Everyone supported and encouraged Graci when she struggled. They are truly amazing. I hope that activities like this will cement the bonds they are forging and help them stay close throughout their lives. At one point in my life, I wanted to be the President of the United States. Now, I just want to be a dad. There is no better calling☺. Awesome! We are also taking a break this fall from sports...heaven. Really. We need to take our kids to UT to hike the Y. I know they would LOVE it! They are going to love reading your post and seeing the pics. I still haven't hike the Y, after how many years? Embarrassing, I know. You have such wonderful kids! Great examples of how siblings should love each other. Thank you for sharing! Way to go guys! Why am I not surprised about Taylor and Parker? Maybe they are like their dad that way? Having a 'whatever it takes' attitude is what being happy in life is all about - whatever it takes to keep family together - whatever it takes to climb the mountain - struggling - here's a hand up - and no need to get even later....in many ways ya'll are some serious Franciscans (those that hold Francis of Assisi as a personal hero!) My favoriate quote from Francis is this one "It is my life to preach the Gospel....and if I have to then sometimes I'll use words"! As for being a Dad - no higher calling - and maybe why we bonded so quickly and closely? love you guys and proud of you too! Love the comment about Parker! When I first read it, I thought, "He made that up, there is no way!" You have great kids, and there is NO BETTER team than UT!!! ; ) We do love the break from sports, but I gotta tell you, seeing your kid out on that football field, nothing can beat it! Frosh year (implied I had more), my roomates and I hiked the Y with some boys. At 10 p.m. in the pitch dark. 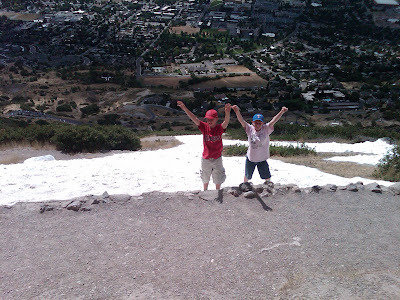 The boys were bored with the switchbacks so they convinced us to go straight up the face of the mountain. Every single girl was dragged up the mountain by her date. But we thought it a success because we all got to the hold the hand of the guy we were with. 18-year-old girls are ridiculous.